The outdoor area of our house has undergone a transformation this year. We've built two pergolas - one for living, one for dining - and even Joe has been forced to admit that it's been the best decision we've made so far in our home. Not only that, the build unexpectedly coincided with the warmest* June for years (*cue total immediate meteorological change) and even though they've only been up a month or so, we've already been able to use them to their best advantage. Dinner outdoors, cold drinks, BBQ's, afternoon get togethers. The thing about good weather and sunshine is that when it happens, my immediate thought is that it must be taken advantage of at that very moment, so a quiet weekend can often turn into a last minute 'small gathering' involving significant amounts of gin and tonic and much regret the next day. 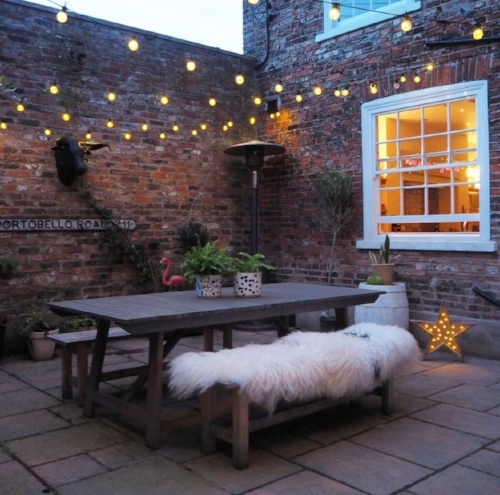 Living in Yorkshire, sitting outside in the summer can often be an endurance test and having a covered space that protects you from our often inclement weather is a must. You can see how I planned out this area by reading my blog here. 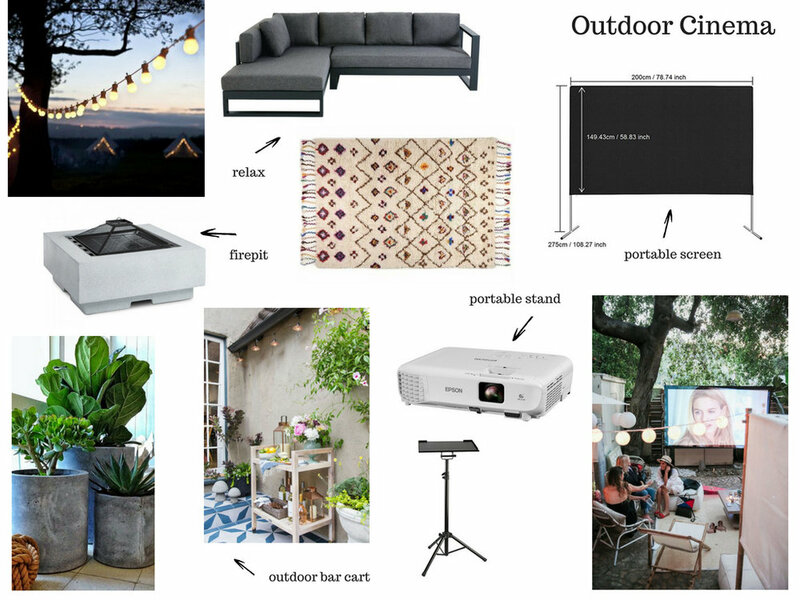 Courtyard or outdoor cinema space? Oh yes. Prior to the pergola erection, our main outdoor living space was the courtyard, enclosed on all sides by brick walls and accessed via a door next to the kitchen. It's a really cool little space. When we moved in, there was wisteria hanging over the top from the neighbours garden, making it feel like you were in your own little Kew Garden oasis. Unfortunately, two years ago they pulled it all down during a garden replan (an act that should come with a penalty charge notice) and it's been looking a little barren ever since. The lack of foliage is not the only issue. Any bird that enters the courtyard is on a suicide mission courtesy of the cat and as such, its not advisable to walk outside without your shoes unless you are fond of innards squelching through your toes. Not only that, she's an excellent mouser and is prone to leaving mini Stuart Little's on the patio. It's also currently home to an unusable table tennis table. Unfortunately, I convinced Joe that it would be fine to leave it outside during the winter as I had bought a cover to protect it. I didn't realise that there was a hole in the cover and as such, it's completely water warped and fit only for the tip, making me even less popular than Wes was when he dumped Laura for Meghan. Last week my mum came to stay and was appalled, not only by the by the selection of cat 'gifts' but also by my lack of flourishing pots. She got out the broom (last seen out in public the previous time that she visited) and set to work to tidy it up, managing to make it a little less pet cemetery and a little more pretty. On a mission, she watered all the surviving greenery and pulled up all the patio weeds. Job done. I've booked her in for next month too. Anyway, in case you've been living in Siberia, you'll know that something very important has been hitting our screens this month. Love Island. Jokes. With two boys and a husband, all of whom are football mad, it's impossible to get away from the World Cup. Not only that, as I write this, England are miraculously still in the running so combined with the weather, it's turning into a month of firsts. I have the best memories of the World Cup from my childhood. 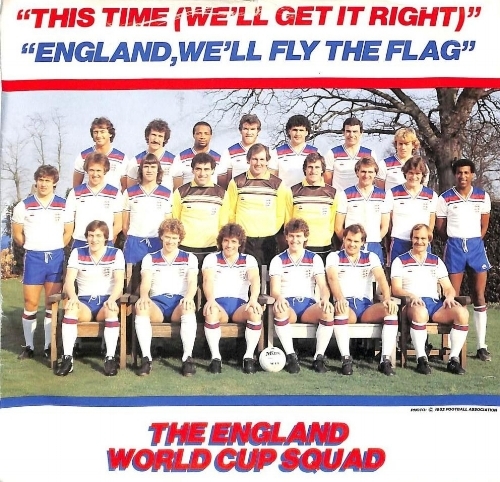 I still know every word to This Time, sung by the England World Cup Squad in 1982 (when I was 11) and headed up by a mullet topped Kevin Keegan. But I'm very much loving that Three Lions by Baddiel & Skinner from that heady Summer of 1998 has resurfaced this year - Leo looked at me in awe/shock/embarrassment when I sang it in the car last week, word perfect. So when I came up with the idea of an outdoor cinema for the boys to watch the matches on, everyone got very excited. But where to put it? The newly cleaned courtyard seems the obvious choice. It's close to the kitchen, it's fairly protected from the elements and it's got power on the wall (an absolute bonus when your husband spends hours running around shouting 'where's the bloody extension lead?' whenever he wants to attempt anything DIY related). It's square shaped, so easy to move furniture around depending on where the sunshine decides to hit (forever hopeful). And best of all, it's pretty much empty and thus a completely wasted space, so an outdoor cinema is an ideal solution to the conundrum of what to put in it. So what am I planning to do with this underused and abandoned space? Thetis garden corner sofa, Maisons Du Monde. Because of the shape of the space, a corner unit is the perfect solution and ideal for us as a family of five. There will also be a space for a hammock - my friends gave me one for my birthday which is still as yet unhung so I've ordered a hammock stand so it can be available for extra seating. I'm also going to add floor cushions and throws for the evening. The chances of my coffee table looking like this are smaller than Stuart Little. I've got a square pallet in the garage left over from my bedroom revamp on Revamp Restyle Reveal and I'm going to attempt to transform this into a coffee table. The likelihood of this exceeding my capabilities is high but I'm going to give it a go as it's the perfect shape. Sumik Kilim Rug, Modern Rugs. An outdoor space doesn't work without a rug, so I'm going to add one to the seating area, as big as I can find, which will add colour and texture to the area. I'm going for modern bohemian rather than pale and neutral and I want to keep it interesting. I'm going to scour the Community Furniture Store for a hostess trolley/shelving unit that I can use as a bar cart for drinks and crisps, the most important part of an outdoor cinema space. I'll also need an ice bucket for putting beer and wine into so that we don't have the take the ten steps to the kitchen and wear ourselves out. A fire pit will keep it warm and cosy and the kids will be able to toast marshmallows and drink hot chocolate. God, I'm feeling as if I'm hurtling towards #parentinggoals already. EREMITT outdoor lantern from JYSK. I've already got festoons strung across the courtyard so they will work brilliantly. I'll add some more to the wall on which the screen will be placed. I'll use tall battery operated lanterns for extra lighting in the corners. And lots of hurricane lamps and candles for ambience, of course. These look easy to look after. Not. It's unavoidable - I'm going to have to get some greenery out there. I'm thinking a visit to our local garden centre will sort this situation. I appear to have lots of empty pots due to murdering previous plant purchases so it shouldn't be too costly. I've also got some empty hanging baskets that I think will add to the look of general plant expertise. Epson EB-W05 Projector HD, ao.com. I've decided to go for a stand alone screen rather than a folded one that can be attached to the wall. I've also ordered a projector stand which is transportable. The reason for this is that we want to be able to move it to other areas of the garden rather than be restricted to one area only. The pergolas are covered so if it's raining, we'll be able to move it and still be able to watch. Joe's first thought was to have a projector shelf on the wall, but I soon managed to convince him that a moveable stand was far more practical. Always right. Obvs. So that's the plan. It's an excellent use of space for the courtyard, plus it's a fun thing to create and also pretty cool. Even the kids are excited at the prospect of having their friends over and having a movie night and Joe's happy at the prospect of additional technical equipment to play with. Now all we need to make the Summer perfect is for the sun to continue to shine and England to keep it up. And did someone mention Love Island al fresco?